City-centre entertainment hot spot, Gorilla recently upgraded their front-of-house (FOH) mixing desk to a brand-new Midas PRO2 Digital Console courtesy of Mason's Games Ltd. The 700-seat venue offers a broad spectrum of live entertainment spanning every imaginable genre and has quickly become a favourite among the night set. Such diversity calls for tremendous flexibility, intuitive ease-of-use and an extremely versatile feature set, which is where Midas comes in. The Midas PRO2 console provides 56 mic/line inputs with remote mic preamps, along with 27 sample-synchronous, phase-coherent mix buses, up to 28 Klark Teknik DN370 31-band Graphic EQs, 12 multichannel FX engines and 96 kHz 40-bit floating-point processing throughout. Two AES3 inputs, three AES3 outputs and dual-redundant power supplies complete the hardware configuration. At the heart of Midas console navigation are its VCA and POPulation groups, which provide access to multiple channels via a single fader (typically grouped into related clusters by mix engineers). Selecting a VCA or POP group brings all members of that group to the control surface. This workflow is applied to every area of the console, ensuring consistent ease-of-use and appropriately fast access to all controls. Additionally, onboard automation allows for fast and easy sound checks for multiple acts via the convenient 1000 scene store and recall capability. Engineers already familiar with MIDAS can load their existing show files straight into the PRO2 via USB stick, regardless of which MIDAS digital console they were created on. An essential element of the installation, the included DL251 stage box serves as the digital snake, providing 48 MIDAS mic/line inputs and 16 analogue XLR outputs at the stage end. MIDI (In, Out, Thru) plus three AES50 ports and one Ethernet connection round out the DL251 rear panel. Connectivity to the FOH console is via shielded, twisted-pair Cat 5e cable with a range of up to 100 metres/330 feet. Dual-redundant power supplies are standard. 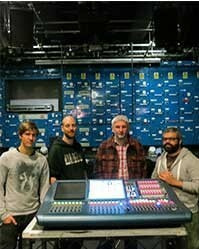 Trof Group, which operates Gorilla, The Deaf Institute, Albert Hall Manchester and Trof Northern Quarter, tasked their Head of Sound, Sean Kelly to select the new console for the venue. Kelly first experienced the Midas PRO Series at Shepherd’s Bush Empire FOH and was impressed with the sound and ease of use — especially the EQ. "Gorilla hosts a wide variety of events, from the loudest rock to the quietest spoken word, so we needed a board that could handle that — and also had wide acceptance with visiting engineers", said Kelly. "Midas PRO Series ticked these boxes and I love the sound — so I had no hesitation in specifying the Midas PRO2 for Gorilla."